As days fly by and summer fast approaches, it’s time to admit that the hour has come to sit down and plan your family vacation. Your procrastination lies in the fact that as your kids approach adulthood (16 to 20) this annual task has become increasingly challenging. Pocket technology and young adults’ penchant for its perpetual use only add to this challenge. As parents you long to plan trips that will engage them to the extent that they freely abandon their phones and related distractions to simply hang out as a family… and love it. But how? Last summer we found the answer: a working cattle ranch. Don’t worry about prior horse knowledge or experience. We had one long-time horse enthusiast and experienced rider (our daughter, 18) and one complete non-horseman with no prior interest or inclination (our son, 20). My husband had ridden casually as a child while I had some familiarity as a “barn mom” — but no actual riding experience. After some online research, we opted to book at Colorado Cattle Company and Guest Ranch, owned and operated by Tom and Darcy Carr in New Raymer, Colorado. It’s listed as an adult-only working cattle ranch but “adult” really means 16-plus. Our days began early (7 a.m.) with grooming and tacking followed by breakfast and a schedule that carried us straight through dinner. 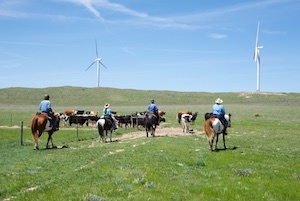 Since this is a working cattle ranch, we were engaged in both skill development and real work. Playing an active role in day-to-day operations proved to be the key to hooking our kids into the cowboy lifestyle for the week. Indeed, all the young adults on the property gladly traded their cell phones and chargers for saddlebags and cowboy hats. One highlight from our stay might illustrate why. Our three lead wranglers shouted instructions, directing us (guest cowboys) to form a big circle around the calf, without chasing it, for easy roping. Surrounding one lame calf certainly sounded easy enough but the next 30 minutes proved that we weren’t bona fide cowboys just yet. As our team failure became evident, wrangler and former pro rodeo rider Scotty (a.k.a. Hawkeye) took charge. He chased and roped the calf, found out he had hoof rot, then swiftly doctored and released him. It was awesome to watch him work! If you want to engage your “adult kids,” give them a challenge like cornering a calf followed up by an authentic spectacle like watching a real cowboy work and you’ll see them dive headlong into the experience. Our kids were hooked and great stories to share and memories to keep began at that moment. The week was filled with cowboy school, herd checks, roping, cutting and penning lessons, a cattle drive, and optional shooting lessons. 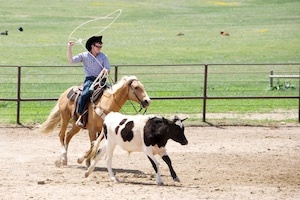 But the climax was the culmination of cowboy school — roping a live calf from horseback on your own. Would your family’s cattle ranch experience exactly mirror ours? Probably not, but hopefully, through this sneak peek, you will see the beauty and potential in this type of vacation experience. At a working ranch, there’s no head-to-tail, tightly controlled, or fully predictable environment, which is great because it’s this inherent quality that leads to spontaneity, unexpected surprises, and ultimately… authenticity. So quit procrastinating; just pull the trigger and book your vacation now! 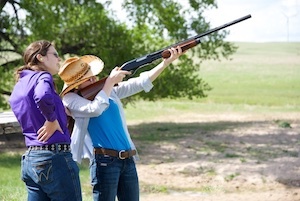 Colorado Cattle Company and Guest Ranch operates seasonally (May-October).